2016 is here; it’s time to put an end to those excuses, stop that procrastination, and roll out those New Year’s Resolutions to military precision. If you’ve promised yourself that you’re going to clean out your clutter and tidy up your wardrobe, you’ll need some modern day storage hacks to help you on your way. If you’re a lover of shades and don’t have protective cases for all of your specs (some of us are guilty of losing them), then finding a safe place to store your sunglasses can be an organisational nightmare. And whilst you may enjoy collecting designer sunglasses as a bit of a pastime (all us fashionistas do), it’s very likely that you’ll own a large selection of cheap sunglasses too – and most budget specs don’t tend to come with a good quality case. If you’ve got an old photo frame lying around in your garage or storage cupboard, why not upcycle it and turn it into something super cool and useful? You’ll get top marks for creativity and your upcycling efforts will make you an eco-warrior too. All you need is some wire and some eye hooks to secure the wire into place. You can also use string or even coloured ribbon if you want to get artistic. Now didn’t I tell you these hacks wouldn’t cost you a penny? All you need is a wooden or a wire hanger – just make sure it’s a traditional triangular hanger with a bottom bar (used to suspend skirts and trousers) – as it’s the bottom bar that you’ll be using to hook your sunglasses onto. 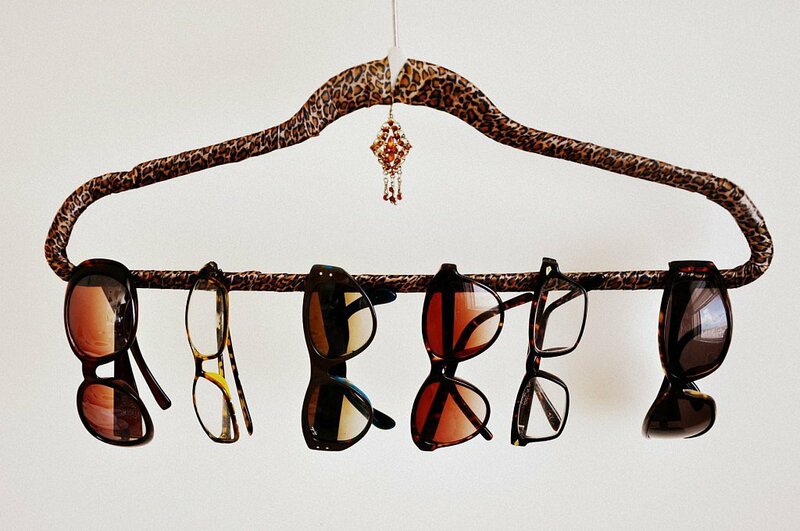 Simply hang your coat hanger inside your wardrobe (allow plenty of room so they don’t get squashed) and suspend your sunglasses along the bottom of the hanger. Alternatively, you can display the hanger on the wall with a nail or a coat hook. If you don’t have a hammer handy, you can use a sticky back coat hook (available from most DIY shops and supermarkets). Who knew that something as simple and dull as a kitchen sink trivet could transform your room into an organisational haven of beautifully arranged fashion accessories? It’s hard to turn your nose up at this storage hack idea because it can be used for just about everything, not just sunglasses! 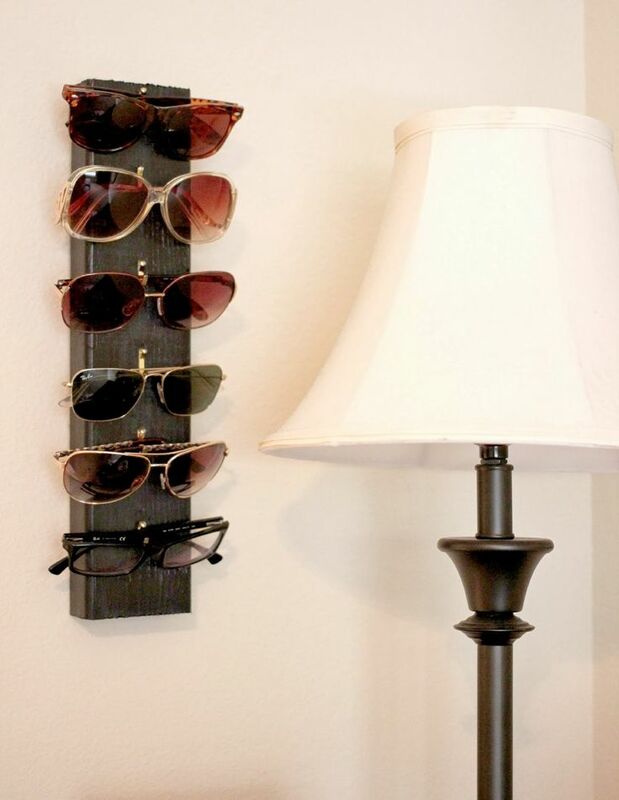 If you want to get arty with your sunglasses display, this storage hack will really make the interior design elements of your room stand out. 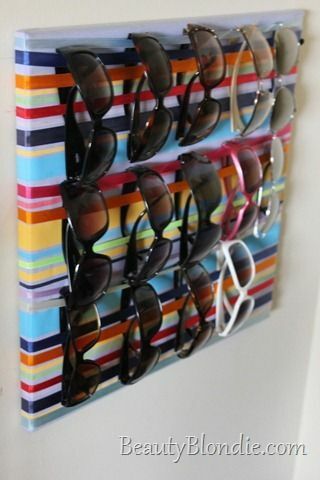 So simple yet so effective, this gorgeous storage hack turns a simple blank canvas, some colourful ribbons and all your sunglasses into something very spectacular. Experiment with a range of colours and different sized ribbons – the different widths and thicknesses of ribbon will create a sense of depth and dimesion. 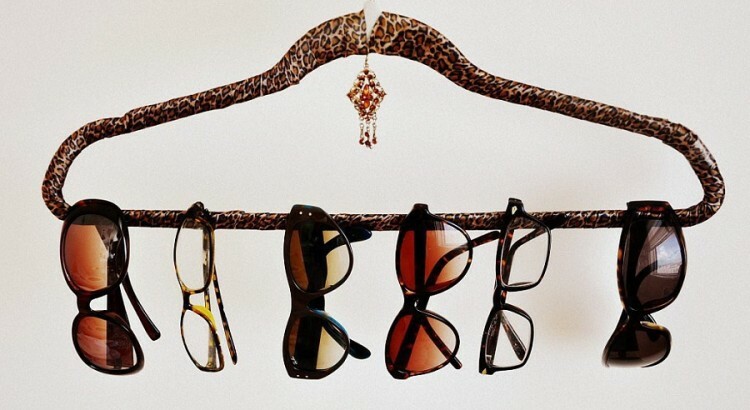 Metal coat hooks are the perfect shape and size to rest the bridge of your sunglasses on and they can be attached to just about anything you want (wooden surfaces or plasterboard are best). Pin them to a wooden board, on your wardrobe door or on your wall to create a simple yet beautiful display.